Working Girl: Project Social: How Do You Motivate Everyone Else? 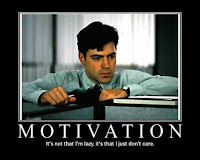 Project Social: How Do You Motivate Everyone Else? I write a lot about motivating employees, both here at Working Girl and at Compensation Café, and for the most part I’ve been focused on how to motivate knowledge workers to higher levels of engagement and creativity. Recently my project social partner Dave Ryan reminded me that a large portion of the workforce is made up of workers who are employed to perform manual rather than creative tasks. Or, as Dave put it in his recent post on employee engagement, what if your company doesn’t have so many of the darlings? So the question is, how do we motivate non-knowledge workers? And the answer is, pretty much the same way you motivate knowledge workers, because when you get right down to it, everyone’s a knowledge worker. Everyone has some specialized knowledge or experience that is somehow relevant to the job they are performing and may - if they are encouraged to apply and develop that experience - enable them to perform better and with more enjoyment. Good management – People who are otherwise hard-working and passionate can lose motivation working for an ungrateful, micromanaging supervisor. Conversely, people who don’t normally go the extra mile may do so out of personal loyalty to a skilled, caring boss. Development – Most people like to feel they are making progress. Once a skill has been mastered it’s important to learn new skills or new applications of the old skills to stay motivated. Offering job rotation or new responsibilities can help keep people interested and open minded. Involvement – So many companies call in ‘experts’ to advise them on best practices and process optimization and that’s fine, but don’t forget you’ve got a house full of experts. Why not ask employees where time could be saved or quality could be improved? Trust – If you give employees a tight script to follow, leaving no room for improvisation when something unexpected comes up – like an angry customer – don’t be surprised if employees take a passive aggressive attitude to problem resolution or customer service. Pay – Overpaying doesn't increase motivation but underpaying is demotivating. People who can will leave and the ones who can are the good ones. Recognition – AKA ‘good manners’. We are all hard-wired to respond to gratitude. Thank people for the good work they do and show appreciation when they go the extra mile. Incentives – Targeted incentives are a powerful motivational tool, although you have to be careful not to motivate in unexpected and undesirable ways. For example, rewarding based on # units can have a negative impact on quality. Excellent Post. Motivation ins being one of the areas I´m getting very interested one. I have just one cent that´s sometimes is very hard for the front line managers keep all those things when the upper management does not have the same way of thinking. Thank you for reading and commenting, Leandro. I'll give you two cents for that comment instead of one because it's very true that upper management sets the tone for any of this to work. I'll only add that a good manager can engage people in an otherwise bad workplace, while a bad one can alienate them in an otherwise excellent workplace. Good point, Derek. We all have the power to rise above petty difficulties and behave well toward peers and subordinates, regardless of what's going on above us. And we should, we know we should. But it's much easier to do so if upper management has the same attitude.